Welcome to the home page for the Rock Creek Community Association in Portland, Oregon! Find all the information about your local community events here. The Rock Creek Community Association is a volunteer organization chartered to maintain the entrances and common areas of Rock Creek and support projects to improve our neighborhood. Our goal is to increase the quality of living in Rock Creek and at the same time increase property values for all residents. The RCCA meets every second Wednesday of the month at the Rock Creek Country Club. Meetings begin at 7 pm and last approximately one hour. Everyone is welcome! Winter, 2018 Newsletter: read the latest newsletter here now or read the glossy color flyer that we recently mailed out to 1750 homeowners in the Rock Creek area. The printed newsletter contains a convenient return envelope for making a volunteer contribution to help support the Rock Creek Community Association (RCCA), or you can use Pay Pal to make a contribution online. · Beautiful selection of a huge variety of plants! · Great prices starting at $2! · Garden art on display for purchase! · Shop local and give back to the community - all proceeds go towards grants and scholarships! Come by and see why people love to shop our sale every year! Don’t miss this incredible selection of hundreds of high-quality plants including perennials, shrubs, trees, and more. Also browse a wide assortment of garden art by local artists for sale. Debit and credit cards accepted, come early for best selection. All proceeds go towards grants and scholarships. The Rock Creek Community has many beautiful private home gardens and the Rock Creek Community Association (RCCA) would like the chance to show case a selection of these gardens in our upcoming Spring Newsletter. Rather than use photos of our entrances, we’d like to show off the inner beauty of Rock Creek. We are seeking personal photos of your home garden, taken within the past 12 months. So Rock Creek residents, show us what you got! Send a photo of your garden or section of your garden along with the season and section of Rock Creek it came from to our website: www.myrockcreek.com. If you are not registered on the website go to the register link at the upper left hand corner of this page to sign up. Then once registered, login and go to the Bulletin Board link and post up to 5 pics using the category Garden Photos. To recap: follow these steps to add photos of your garden. Your garden is your own and everyone's is different, so don't be afraid or hesitant to send us your photos. The Board will review the photos and use as many as we are able to share with the community on the Spring and Winter newsletters. All submitted photos will be viewable on our website. Please submit your photos no later than May 1st. We’re anxious to share the beauty and love of gardening within Rock Creek! 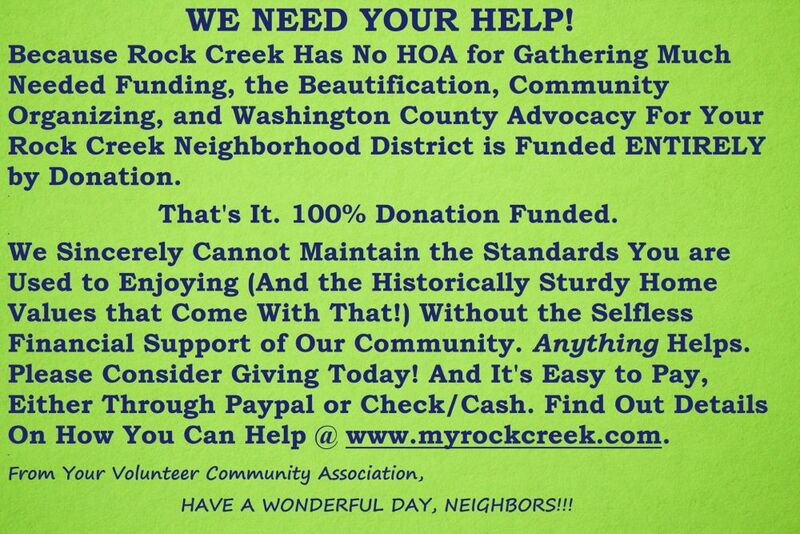 If you would like to contribute to the Rock Creek Community Association, you can now do so online. Just click HERE or on the Online Payments tab, and enter the amount of the Voluntary Contribution that you would like to make, then click Next. You will be redirected to PayPal where you can securely complete the transaction. Residents who do not have a PayPal account can use a credit card to pay as a Guest, or they can setup a PayPal account for future use. THANK YOU TO THE MANY HOMEOWNERS WHO HAVE GIVEN RCCA GENEROUS DONATIONS AFTER OUR REQUEST FOR HELP HERE AND IN THE RECENTLY MAILED SPRING AND WINTER, 2018 NEWSLETTER. Your generous donations have helped to pay for maintaining the entrances to Rock Creek and for special projects such as the new Rock Creek sign boulder at the Kahneeta entrance, and the upcoming re-landscaping of the Cornelius Pass entrance. Keep up with what is going on in the neighborhood, and share it with your friends and neighbors. Login to to your Facebook account to make comments on our Facebook page (or create your own Facebook login if you are not already on Facebook). Click on the Bulletin Board tab to post events of interest to others in the Rock Creek Community. You can also place a free classified ad for items or services of general interest to the community. We will review your listing or ad for suitability, and if your submission is approved, it will immediately be posted. You can include up to 5 photos, and specify an ending date for your listing or ad. (http://www.co.washington.or.us/Sheriff/YourSheriff/who-patrols-my-neighborhood.cfm ) and enter your address to find out.